The Ghanta and Vajra are the principle ritual tools of Tantric Buddhism, the ritual bell and diamond scepter. Also known as dril-bhu and dorje in Tibet, together they are the symbols of wisdom and method. The combination of wisdom and method is a basic principle of Tantrism. The method is seen particularly as compassion,wisdom as the consciousness which can concieve of the Void. The Vajra is a symbol of the indestructible, the male principle, the means of salvation, the primordial condition of the individual in its aspect of unlimited manifestation. The Ghanta is a symbol of the Void, the female principle, the means of wisdom. When the bell and diamond scepter come together, an inner mystical unity is achieved. The diamond scepter or Vajra is always picked up first by the right hand, and then the bell or Ghanta is picked up by the left hand. The bell is made from a consecrated bronze alloy, and was introduced into Tibet as a gift to the Karmapa at Tsurphu monastery by the Chinese Emperor. The Ghanta and Vajra are excellent focusing tools for meditation and healing, as well as a very good 'clearing' tool. The Ghanta is made in 3 sizes anywhere from 8 finger widths to 22 finger widths in height. There are 2 primary styles in Tibet, Nyingma and Kagyu. 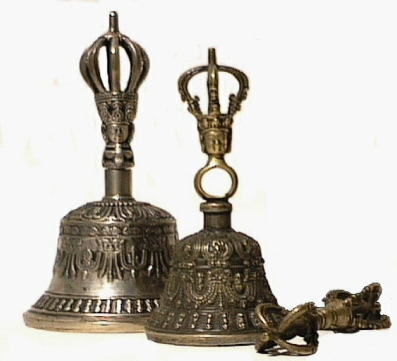 Similiar bells are found in China and Japan. The Sharma or New Bön use this bell, but it has no outer decoration. In shamanism, bells are used to summon spirits, their sound represents the element of air, the realm of the spirits.